I think Teri is trying to force me into retirement. Otherwise, she wouldn’t have sent me the details on this chocolate (with chocolate mousse filling) Metal Gear Solid cake by Rosebud Cakes. Game over, man. I can only hope the Lords of the Internetubules can someday deliver unto me a confectionery geeky specimen that won’t pale in comparison to this one. Teri got in touch with me with the Metal Gear Solid cake’s details after seeing the Sweet 16 Dinosaur Cake a couple of weeks ago. I wholeheartedly concur about the Sweet 16 issue and even your thoughts on teenagers in general. They’re self-involved ingrates with occasional bouts of entertainment value? Having four in my blended family, I see your point, but mine are different, being geeks, the whole lot of them. All sweethearts. Anyway, my daughter just turned sixteen this year and for her Sweet 16, we got her a pretty damned awesome cake combining her two favorite things on the planet, pretty much, those being Metal Gear Solid and dinosaurs—velociraptors, to be exact. 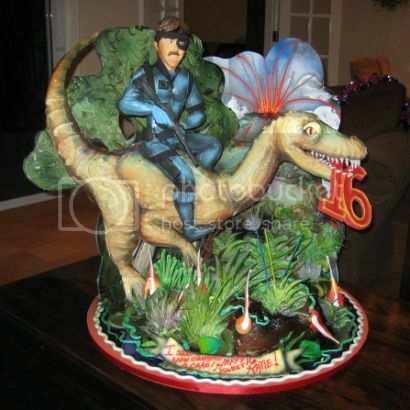 What better cake than the game’s main character, Solid Snake, riding a velociraptor? The cake was made with actual frosting, not gum paste or molded chocolate like some specialized cakes, and most of it was edible. And delicious. She loved it and her friends loved it. Thanks for giving me continued hope for America’s youth, Teri. Even though hope and America’s youth both give me the sort of intestinal discomfort than can only come with the confident expectation of complete disappointment. I still appreciate it. This is so cool! We have to know. Is this a Rosebud Cakes (L.A.) design? Rick swears it is. He used to work there and Elin’s style is recognizable. Can you confirm? Yes, Rosebud Cakes did the cake. True artists and professionals. Good eye! But Solid Snake is a video game character, so you don’t know how tall he really is. That cake could even be a 1:1 scale model. Can’t help you with the feathers, though. Thank you for confirming Teri (and Mike!). Rosebud does amazing work. Aloha! Though velociraptors weren’t that terrifying the Utah Raptor, which was discovered sometime after Jurassic Park was made, was actually as tall the freaky guys in the movie. So we can just pretend that’s a Utah raptor and all is right with the world.